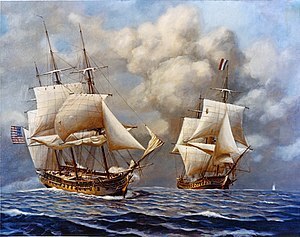 The Quasi-War (French language: Quasi-guerre) was an undeclared war fought mostly at sea between the United States and the French Republic from 1798 to 1800. In the United States, the conflict was sometimes also referred to as the Undeclared War With France, the Pirate Wars and the Half-War. The Kingdom of France had been a crucial ally of the United States in the American Revolutionary War since the spring of 1776, and had signed in 1778 a treaty of alliance with the United States of America. But in 1794, after the French Revolution toppled that country's monarchy, the American government came to an agreement with the Kingdom of Great Britain, the Jay Treaty, that resolved several points of contention between the United States and Great Britain that had lingered since the end of the American Revolutionary War. It also contained economic clauses. The United States had already declared neutrality in the conflict between Great Britain and post-revolution France, and American legislation was being passed for a trade deal with Britain. Coupled with the U.S. refusal to continue repaying its debt to France on the grounds that the debt had been owed to the French Crown, not to Republican France, the French outrage at the United States led to a series of responses. French privateers began seizing American ships trading with Britain, and the French government refused to receive the new United States minister Charles Cotesworth Pinckney when he arrived in Paris in December 1796. In his annual message to Congress at the close of 1797, President John Adams reported on France's refusal to negotiate and spoke of the need "to place our country in a suitable posture of defense." In April 1798, President Adams informed Congress of the "XYZ Affair", in which French agents had demanded a large bribe for the restoration of diplomatic relations with the United States. The French Navy inflicted substantial losses on American shipping. Secretary of State Timothy Pickering reported to Congress on June 21, 1797, that the French had seized 316 American merchant ships in the previous eleven months. The hostilities caused insurance rates on American shipping to increase at least 500 percent, since French marauders cruised the length of the U.S. Atlantic seaboard virtually unopposed. The administration had no warships to combat them; the last had been sold in 1785. The United States possessed only a flotilla of small revenue cutters and some neglected coastal forts. Increased depredations by privateers from Revolutionary France required the rebirth of the United States Navy to protect the expanding American merchant shipping. Congress authorized the president to acquire, arm, and man not more than twelve vessels, of up to 22 guns each. Several vessels were immediately purchased and converted into ships of war, and construction of the frigate Congress resumed. July 7, 1798, the date that Congress rescinded treaties with France, is considered the beginning of the Quasi-War. This was followed two days later with the passage of the Congressional authorization to attack French warships. The U.S. Navy operated with a battle fleet of about 25 vessels. These patrolled the southern coast of the United States and throughout the Caribbean, seeking French privateers. Captain Thomas Truxtun's insistence on the highest standards of crew training paid dividends as the frigate USS Constellation captured L'Insurgente and severely damaged La Vengeance. French privateers usually resisted, as did La Croyable, which was captured on July 7, 1798, by the USS Delaware outside of Egg Harbor, New Jersey. The USS Enterprise captured eight privateers and freed 11 American merchant ships from captivity. The USS Experiment captured the French privateers Deux Amis and Diane. Numerous American merchantmen were recaptured by the Experiment. The USS Boston forced Le Berceau into submission. Silas Talbot engineered an expedition to Puerto Plata harbor in the Colony of Santo Domingo, a possession of France's ally Spain, on May 11, 1800; sailors and Marines from the USS Constitution under Lieutenant Isaac Hull captured the French privateer Sandwich in the harbor and spiked the guns of the Spanish fort. Only one U.S Navy vessel was captured by (and later recaptured from) French forces, the USS Retaliation. She was the captured privateer La Croyable, recently purchased by the U.S. Navy. Retaliation departed Norfolk on October 28, 1798, with Montezuma and Norfolk, and cruised in the West Indies protecting American commerce. On November 20, 1798, the French frigates L’Insurgente and Volontaire overtook Retaliation while her consorts were away and forced commanding officer Lieutenant William Bainbridge to surrender the out-gunned schooner. Montezuma and Norfolk escaped after Bainbridge convinced the senior French commander that those American warships were too powerful for his frigates and persuaded him to abandon the chase. Renamed Magicienne by the French, the schooner again came into American hands on June 28, when a broadside from USS Merrimack forced her to haul down her colors. Revenue cutters in the service of the United States Revenue-Marine, the predecessor to the United States Coast Guard, also took part in the conflict. The cutter USRC Pickering, commanded by Edward Preble, made two cruises to the West Indies and captured 10 prizes. Preble turned command of the Pickering over to Benjamin Hillar, and he captured the much larger and more heavily armed French privateer l’Egypte Conquise after a nine-hour battle. In September 1800, Hillar, the Pickering, and her entire crew were lost at sea in a storm. Preble commanded the frigate Essex, which he sailed around Cape Horn into the Pacific to protect American merchantmen in the East Indies; he recaptured several ships that had been seized by French privateers. American naval losses may have been light, but the French successfully seized many American merchant ships by the war's end in 1800—over two thousand, one source contends. Although they were fighting the same enemy, the Royal Navy and the United States Navy did not cooperate operationally, nor did they share operational plans or come to mutual understandings about deployment of their forces. The British did sell the American government naval stores and munitions. In addition, the two navies shared a system of signals by which each could recognize the other's warships at sea, and allowed merchantmen of their respective nations to join each other's convoys. A 20th century illustration depicting United States Marines escorting French prisoners. By the autumn of 1800, the United States Navy and the Royal Navy, combined with a more conciliatory diplomatic stance by the government of First Consul Napoleon Bonaparte, had reduced the activity of the French privateers and warships. The Convention of 1800, signed on September 30, ended the Franco-American War. Unfortunately for President Adams, the news did not arrive in time to help him secure a second term in the 1800 presidential election. Supporters of a broad executive war power have sometimes appealed to the Quasi-War with France, in the closing years of the eighteenth century, as an example of unilateral warmaking on the part of the president. Francis Wormuth, an authority on war powers and the constitution, describes that contention as "altogether false." John Adams, "took absolutely no independent action. Congress passed a series of acts that amounted, so the Supreme Court said, to a declaration of imperfect war; and Adams complied with these statutes." In a revealing incident that occurred during the Quasi War, Congress authorized the president to seize vessels sailing to French ports. But President Adams, acting on his own authority and without the sanction of Congress, instructed American ships to capture vessels sailing either to or from French ports. Captain George Little, acting under the authority of Adams' order, seized a Danish ship sailing from a French port. When Little was sued for damages, the case made its way to the supreme court. Chief Justice John Marshall ruled that Captain Little could indeed be sued for damages in the case. "In short", writes Louis Fisher in summary, "congressional policy announced in a statute necessarily prevails over inconsistent presidential orders and military actions. Presidential orders, even those issued as Commander in Chief, are subject to restrictions imposed by Congress." ↑ Mooney, James L., ed (November 1983). Dictionary of American Naval Fighting Ships. 6. Defense Dept., Navy, Naval History Division. p. 84. ISBN 0-16-002030-1. http://books.google.com/books?id=BgBLH14faIgC&pg=PA84. Retrieved June 27, 2011. ↑ "America’s First Limited War", Lieutenant Colonel Gregory E. Fehlings, U.S. Army Reserve. Allen, Gardner W. (1909). Our Naval War with France. New York: Houghton Miffn Publishers. ISBN 0-945726-58-9. Daughan, George C. (2008). If By Sea: The Forging of the American Navy - From the Revolution to the War of 1812.. Philadelphia: Basic Books. ISBN 978-0-465-01607-5. De Conde, Alexander (1966). The quasi-war: the politics and diplomacy of the undeclared war with France 1797–1801. New York: Scribner's. Kingston, Christopher. "Marine Insurance in Philadelphia During the Quasi-War with France, 1795–1801." Journal of Economic History (2011) 71#01 pp 162–184. Leiner, Frederick C. (1999). Millions for Defense: The Subscription Warships of 1798. Annapolis: US Naval Institute Press. ISBN 1-55750-508-X. Love, Robert (1992). History of the U.S. Navy Volume One 1775-1941. Harrisburg: Stackpole Books. ISBN 0-8117-1862-X. Palmer, Michael A. Stoddert's war: Naval operations during the quasi-war with France, 1798-1801. Naval Institute Press, 1999. Toll, Ian W. (2006). Six Frigates: The Epic History of the Founding of The U.S. Navy. New York: W.W. Norton. ISBN 0-393-05847-6. Unger, Harlow (2005). The French War Against America: How a Trusted Ally Betrayed Washington and the Founding Fathers. Hoboken, NJ: John Wiley & Sons, Inc.. ISBN 978-0-471-65113-0.